It’s no secret that I’m a big fan of Opera Mini, the free full-web browser that makes it possible you use almost any website on most any phone. Amazingly, using sites designed for an 800×600 px screen on one a tenth as large is both practical and pleasant in Opera Mini, thanks its combination of server side compression, smart reformatting techniques like content folding and fit to width and a brilliant user interface built a around one and two-click shortcuts for common tasks. I use Opera Mini for a couple of hours a day and it has largely eliminated my need for a PC for checking email, following over 100 news feeds and approving comments on this site. Opera Mini’s success seems to have encouraged other companies to create their own free, installable browsers for mobile phones. This is a welcome development. As good as Opera Mini is their is always room for improvement and competition spurs both improvement and innovation. A few sites that I use don’t work well or at all in Opera Mini so I’m hoping one of these alternate browsers will. It would also be nice to have features Opera Mini lacks like tabbed browsing, the ability to copy text from a page and to spoof the browser user agent for sites that block access to mobile browsers. Probably impossible in a Java based browser but certainly desirable would be support for embedded media especially Flash video. I’ve been trying out three alternate browsers that promise full web browsing like Opera Mini and offer additional features. This post is dedicated to looking at the TeaShark browser. Subsequent posts will examine UC Web and Skyfire. TeaShark, like Opera Mini, is a proxy based or server assisted browser. When you request a page, a server loads, parses and renders it using an actual desktop browser engine and then compresses the displayable page in a proprietary format and sends it to a thin Java client on the phone for decompression and display. This is what makes it possible for both Opera Mini and TeaShark to deliver fast full web browsing to low end phones on slow networks. The two browsers use different desktop rendering engines, Mini uses Opera 9.5 and TeaShark, the open source WebKit browser engine. I’m going to compare the three browsers in seven areas, features, performance, rendering accuracy, usability, compatibility with a variety of sites, compatibility with various phones and security. There is a limited copy text function in Teashark which is also quite useful. You can select text on any Web page and then search Google, Wikipedia or UrbanDictionary.com for the selected text (2nd Image). If the text is a phone number you can call also the number. Teashark has inline editing of text fields, unlike Opera Mini which opens the phone’s native full screen edit window, hiding the original form. When editing inline, Teashark does word completion based on prior entries but only triple-tap mode is supported. By choosing “Menu > Edit” you can bring up the field in the phone’s native full screen editor where all the built in entry modes like t9 (or iTap), symbol and numeric are available. The history function in Teashark works much like history in S60Webkit. When you press the right-softkey, which is TeaShark’s “Back” button, a small window opens at the bottom of the screen showing thumbnails of visited pages (3rd image). Scrolling through the thumbnails instantly loads the page if it is in the cache. This is nice but Teashark’s cache only seems to hold two or three pages unlike Opera Mini which can cache a dozen or more. As with desktop browsers and with Opera Mini, Teashark’s history is persistent across sessions (4th image). 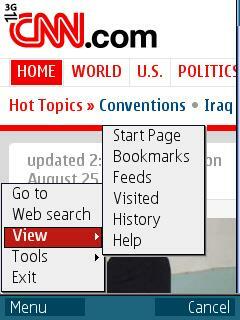 However, Teashark lacks a number of useful features found in Opera Mini. There is no “Fit to Width mode“, saving of pages or images, bookmarklet support or direct file upload or download. Teashark is unsigned so obtrusive security prompts appear on many phones. Winner: Opera Mini. Athough I really like TeaShark’s tabs and searching by copying text, I use bookmarklets, page saving and “fit to width” in Opera Mini daily. There’s no way I’d give those features, not even for tabbed browsing. I define performance as speed plus reliability, how fast do pages load on the average, and if the browser can load a given page, can it do so all the time, every time without breakdowns or crashes. Opera MIni is noted for it’s speed and most of the time it is extremely fast. 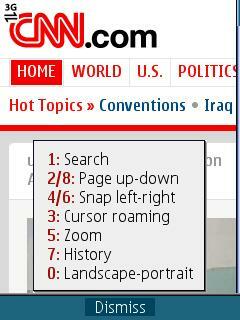 To test speed I used the WapReview Mobile Directory’s 447 KB page for the “News” category. I loaded the page three times, clearing the cache each time and averaged the results. 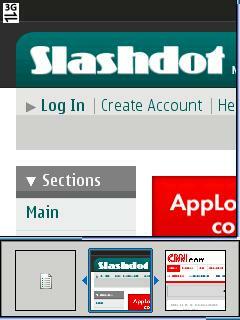 On a Nokia N95-3 using ATT’s 3G connection, Opera mini in desktop mode loaded the page in 19 secs. After the Mini server preprocessed and compressed the page it was only 191 KB. Teashark surprised me in this test by loading the page even faster, averaging only 16 seconds. The compressed page size was 217K. Service outages on Opera Mini are extremely rare, I only remember experiencing three all this year and only one was longer than an hour although the one that was lasted most of a weekend. The Opera Mini servers do slow down occasionaly, doubling or even tripling load times but again this is uncommon. Crashes and lockups are also rare with Opera Mini although they do occur. I’ve only been using TeaShark for a week and I’ve found it quite unreliable. Pages that normally load in a few seconds suddenly start taking 10 times as long or fail entirely with a timeout error. TeaShark’s timeout is fixed at 40 seconds, unlike Opera’s with can be increased to as much as 3600 seconds, essentially unlimited. At least TeaShark is pretty stable, it only crashed once during the week I was testing it. Opera Mini also crashed once in the same period. Winner Opera Mini. Teashark’s slight speed advantage doesn’t begin to compensate for it’s unreliability. Both browsers generally do a reasonably good job of faithfully rendering desktop sites. Both are occasionally guilty of overlapping text or are missing parts of the page, particularly buttons and images. With Opera Mini, pages with overlapping or missing elements in “Desktop Mode” are often OK in Fit tTo Width “Mobile View” and vice-versa. Both have browsers don’t properly display italic text. Opera Mini displays it as regular text, Teashark displays regular Italic as bold italic. Bold italic text is displayed as bold regular by both browsers. Tie. Neither browser has clear superiority in rendering. I’m biased as I’ve used Opera Mini daily for the last three years and know its UI inside out, but I think it has much better usability. The main difference is the use of shortcuts. Opera has 33 one or two-key combinations for just about every common task. All functions are also available through the menu system in case you don’t remember the shortcut. TeaShark has just nine one-key shortcuts (5th image), mostly for page navigation (Zoom, page up, down, left, right etc.) Opera Mini has those plus 15 two-key shorts to perform common operations like jumping to the bookmark list, settings dialog or home page and for bookmarking or refreshing the current page. In Teashark, these operations require going into the menu system which always takes more clicks (6th image). 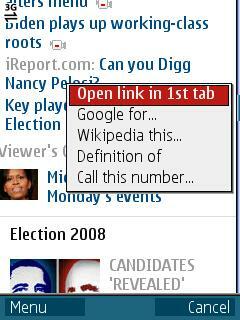 And then there is Opera Mini’s Speed Dial which provides two-key access to your nine favorite bookmarks or bookmarklets. TeaShark doesn’t have any equivalent of Speed Dial and doesn’t support bookmarklets either. Although Opera Mini can handle more different full web sites than any other mobile browser I’ve used, there are still a few sites it has problems with, Including three that I use regularly; the full versions of Yahoo Mail, Bloglines and 1and1 Webmail. I was hoping that Teashark would work with at least some of these. The problem with Bloglines in Opera Mini is that although I can log in and view the list of my subscribed feeds, when I click a feed, which should load the unread items in that feed, nothing happens. This occurs with both the “classic” version of Bloglines and the Beta at beta.bloglines.com. I first tried the Beta , which I prefer, in Teashark and got nowhere. I couldn’t even log in, as the Submit button on the login form was missing! But I found success with the “Classic” version of Bloglines which works perfectly in TeaShark. 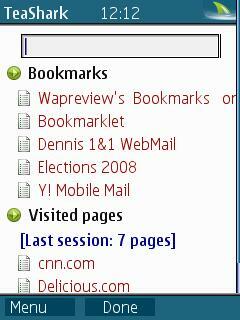 The full-web Yahoo “Mail Classic” isn’t too bad in Opera Mini. The only real problems I have with it are that I can’t do mass operations, like tagging several emails and deleting them or moving them to a folder as a single operation. The check boxes and buttons are there, but when you try to use them the page just reloads without doing anything useful. I can at least delete emails one at a time by opening each one and then pressing the delete button for that message. Moving messages doesn’t work even in single message view. When you press the Move button, a drop down list of folders appears but the folder names will not accept focus so there is no way to chose the one you want to move the message to. Teashark was no help, it had the same issues as Opera Mini plus even deleting messages one at a time was impossible as the delete button was missing in single message view. I use 1and1 for hosting, including my mail server. They provide a webmail interface for reading and managing email. Unfortunately I can’t use 1and1 WebMail with Opera Mini, as after I login it “hangs” on a “Loading..” splash screen. I was very pleased to discover that Teashark handles the site with no issues whatsoever. Although TeaShark can open some pages that Opera Mini can’t the opposite is also true. It has problems with quite a few sites that work well in Opera Mini. It consistently fails to load certain Wikipedia results pages including those for “Japan”, “Tokyo” and “India”. At least it loads Wikipedia’s entry for “Teashark” ):. I don’t seem to be able to open pages that use HTML Basic Authentication with TeaShark either. And on my personalized Yahoo home page, half my RSS feeds show no content, just the text “loading…“. Another Tie. Neither browser works with every site. But if you have both of them installed on your phone there is a good chance that one or the other will. One of great things about Opera mini is that it runs on almost any phone from the latest S60, Blackberry and UIQ handsets to inexpensive prepaid phones like Boost Mobile‘s Motorola i425 and i855. There’s even a low memory, MIDP 1 version of Opera MIni 3.1 that works well on ancient handsets like the Nokia 6200. I tested Teashark with three phones, a Nokia N95, Motorola Z8 and a Motorola i855. Teashark worked well on the N95 and Z8 but not the i855. I could only run it once on the i855 and even then the key mappings were all wrong. The phone’s menu key performed the function normally mapped to the OK button. The softkeys and dpad did nothing at all: there was no way to bring up TeaShark’s main menu which is mapped to the left softkey. Plus, once I shut down Teashark the first time it never ran again, only displaying a blank white screen when launched. There are no low memory or MIDP 1 versions of TeaShark, further limiting its compatibly. Opera Mini and Teashark are both proxy based browsers. All traffic passes through the vendor’s servers where it is parsed, reformatted and compressed. This means that a “Man in the Middle“ attack is possible. An unscrupulous employee or a hacker who has gained access to the server could theoretically see the pages you are browsing, including reading your web based email and data entered, even passwords. Data protected by encrption on secure (SSL) sites is vulnerable too as the proxy server has to decrypt the data in order to process it. Opera Software is a public company based in Norway with offices around the world. The identities of it’s officers and principals are a matter of public record. Opera is a profitable company which counts mobile carriers and e-commerce sites including eBay as customers. It has a reputation for integrity and its business model depends on maintaining that reputation. All of this makes Opera accountable. I consider an Opera Mini security breach extremely unlikely. However, I don’t use Opera Mini for online banking or shopping, preferring to use S60WebKit or Opera Mobile with their end to encryption for those purposes. I’m keeping Teashark on my N95 and Z8 as an alternative browser for use on sites like Bloglines and 1and1 Webmail where Opera Mini doesn’t work. But for the vast majority of my browsing I will still use Opera Mini. TeaShark’s unreliability, lack of features important to me, especially fit to width and bookmarklets, and doubts about its security will keep me from using it as my main browser. This entry was posted in Browsers, Search and tagged Java ME, mobile browsers, Opera Mini, Sky Fire, TeaShark, UC Browser by Dennis Bournique. Bookmark the permalink. Yes,you are right…Teashark is really truly dead…! or suggest a site to get it? Tea shark is useless.This app. Opening very first,but web sites are not opening. @Anas i hope it is not too late for reply, try to find an Opera Mini’s jar file and not a jad file (that you find on Opera Mini’s official mobile site). Some phones (not Nokia) with some carriers, don’t simply install Java app or game if you download the jad file. Between i’m writing this with teashark for free on Orange. @Dennis Well about this post, i’d like to know whether you have any kind of news about Teashark two years after their last release. After reading your review i’m going to delete Teashark. I wasn’t aware of its ‘mystery’ status. I’m not sure about your review. I tried using opera mini in my n95 and it’s very slow on a 3g network. I’ve using teashark nowadays because it’s extremely fast. I been comparing these two for a long time now and the speed difference is very noticeable. opera mini is very slow. I want you guys to try it. i don’t have anything against opera but honestly it’s so slow in my n95. slower that the nokia browser. Opera Mini, Teashark and UCweb all work the same way. 1 A thin Java client on the phone that sends your requests for web pages to a dedicated proxy on a specific IP address and port. 2. A proxy sever in “the cloud” processes the client’s request, retrieves the web page, parses and renders it and converts into into a compact binary representation which the client can display with a minimum of processing. All three use different binary formats so there is no way that Opera Mini could work with UCweb or Teashark’s proxy. Have you tried Opera Mini 3.1? It uses a different proxy, maybe Airtel doesn’t charge for it. Also try both socket and http on 3.1 and 4.2. They use different ports and maybe Airtel charges for one and not the other. I don’t think that would work as TeaShark’s proxy doesn’t send html to the client, it use a proprietary compressed binary format. I don’t think any other browser handle TeaShark’s format. as u said that teashark and opera are proxy based browser. and we all know that teashark can be used to surf free airtel gprs but teashark doesnt provide that much good results as opera or other browser. my question is can we use that proxy in any other browser like ucweb(sis) or netfront or opera. That’d be nice :). Coz i am thinking about shifting over to the smart phone arena :D.
I have both the Java and native versions installed on a couple of phones and plan to cover both when I get around to writing the review. Btw, i dont have a smart phone, hence personally i would like to see the review about the J2ME version of UCWEB 6.1. But you might wish otherwise :D.
Opera Mini is unmistakably the winner. 1. There is no effective support. 2. Its been a painfully long wait for the final version of teashark. Waiting for the review of the next competitor, the one which i think is the real competitor……..